For the first time since June 9, the Liberal Bee Jays have lost a baseball game. 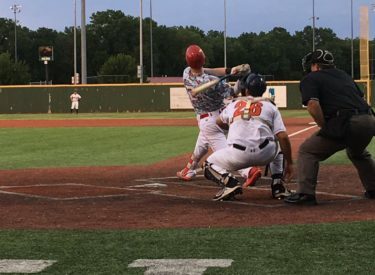 After 10 consecutive wins, the BJ bats fell silent I bet a 3-2 loss to the El Dorado Broncos Friday night at McDonald Stadium and Brad Law Field in El Dorado. Liberal had only two hits. Darrin Cook pitched six strong innings for the Bee Jays allowing one run, with six strikeouts, and one walk. Derek Craft pitched 1 and 2/3 scoreless with four strikeouts. El Dorado’s pitcher Hunter Larson was pitching a no hitter through 5 and 1/3 until a Zac Cook line drove up the middle struck Larson in the side of his head. The scene cause a hush over the concerned crowd. It was later announced by he El Dorado PA announcer that Larson was doing well in the hospital. After a walk, Garrett Scott popped a double down the right field line to score Cook. Colton Onstott grounded out but scored another run to make it 2-0 in the sixth. The Broncos scored one in the bottom of he sixth to tie. They scored two in the seventh to take the 3-2 lead. Liberal remains in first at 13-4 while the Broncos are 8-10. Hays beat Derby last night so the Larks are 11-4 and Derby is 11-6. Liberal plays at El Dorado again Saturday night at 7 with the Dugout Show at 6:45 on 1270 and kscbnews.net.